Oh my goodness, Connie Willis knows how to make me laugh. To Say Nothing of the Dog is among the funniest books I’ve ever read, and Belwether is awfully funny, too. It also has me thinking about how we define science fiction. You see, I was going to talk about how I’ve always thought of Willis as a science fiction author but that this isn’t science fiction—it’s a comic novel set in the present day (or the novel’s present, meaning the early 1990s). But as soon as I thought about it, I realized that it’s a book all about scientists. So there’s science and there’s fiction. Science fiction. But not futuristic science fiction. No one is going into space or traveling through time. They’re filling about paperwork and trying to figure things out (often paperwork). The narrator, Sandra Foster, is a sociologist who studies fads—hula hoops, ouija boards, mesmerism, and hot pants. Where do they come from, how do they spread, and when and how do they end? She works in R&D for a company HiTek. HiTek funds all sorts of research, but they mostly have meetings where they engage in sensitivity exercises and learn about new management schemes (always in the form of an acronym—PESTO or GRIM, for example). Her bigger problem, however, is Flip, the interdepartment assistant who refuses to do anything more than deliver the mail, and she rarely does that correctly. Flip’s misdelivery of a package puts Sandra in touch with a biologist named Bennett O’Reilly who is studying chaos theory. He also appears to be entirely impervious to trends. As a student of fads, Sandra doesn’t know what to make of him, but she can’t stop trying to figure him out. There are also a bunch of sheep. This book is a lot of fun to read. Each chapter begins with a short description of a fad that may or may not relate to events in the chapter. And we get Sandra’s observations of the fads around her and the way people quickly jump from one bandwagon to another, pretending that their previous favorite thing had never been any good at all. It’s all exaggerated for humorous effect, and for me, it was effective humor. I especially appreciated how Willis was able to use the fact that the book is all about fads to include a lot of 90s fads without making the book seem dated. And then there are the ones that I’m pretty sure she completely made up. It helps, too, that I really liked Sandra as a narrator. She’s smart and observant and cynical without being unkind. In fact, her kindness proves to be the key to her success, if it can be called success. One of the book’s main interests is what leads to scientific break-throughs. Is it all hard work? Flashes of inspiration? Pure luck? Sandra contemplates lots of stories of scientists who made great discoveries by chance. For instance, it was an untidy office and accidental contamination that led Alexander Fleming to discover penicillin’s healing power. In their studies of fads and of chaos theory, both Sandra and Bennett are trying to get at where ideas come from. And HiTek is trying to make ideas happen. So is there a secret? And can it be harnessed? Every time I read Connie Willis, I want more. 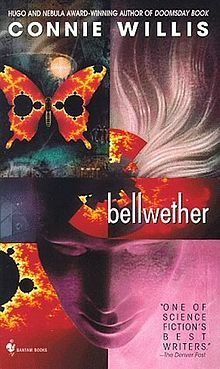 I’ve read To Say Nothing of the Dog, The Doomsday Book, and now Bellwether. So what should be next? I love this book as well! Her research in fads fascinated me. Uncharted Territory is very funny too, though it has a serious side. It’s also more typical science fiction. I was reading it on a train once and nearly missed my stop, I was so absorbed in the story. I don’t think I’ve ever heard of that one. I’ll keep an eye out for it! I’m so pleased you liked this! Passage is one of my favorites of hers, though it’s much more serious. It’s also repetitive (though that is on purpose and part of the nature of the book.) You’ve read two of her time-travel books, so if you wanted to make a commitment to a chunkster, you could read Blackout/All Clear. Don’t think of them as two separate books! And her short stories are also great. I actually have Blackout/All Clear out from the library–picked it up on impulse back in December. I’m not sure I’ll get it them before they’re due, but I really want to read them. This isn’t an author I know but it sounds as though I should do something about that. I am all for books with dogs in them (as long as nothing awful happens to the dog) so maybe I should look for ‘To Say Nothing Of The Dog’ but I must say I am intrigued by those sheep. To Say Nothing of the Dog is actually a time-travel book that includes the characters from Three Men in a Boat. It’s really funny–and the dog is a delight! But then again, so are the sheep. I have to admit I like the funny Connie Willis best — i.e. this one and To Say Nothing of the Dog. If she would write more in that vein I would be all over it! I guess I should check out Uncharted Territory. I read Blackout, but then it had been too long before All Clear appeared so when I tried to read it I was lost. I’m planning to go back and read them both together at some point but it is a time commitment I haven’t been ready to make yet. I liked The Doomsday book a lot, but it’s definitely more sad than funny. It’s hard for me to find funny books that I enjoy, so I’d be happy for Willis to write more like this. I vote for Passage. But it’s not funny. Or at least, I don’t remember it being funny; possibly it was being funny when it wasn’t making me sob. But I thought it was great. I read it after To Say Nothing of the Dog and Bellwether, and it wasn’t what I was expecting. I’ll add Passage to the list. I think I’ve actually had it out of the library, but I didn’t read it. (And this book solidified my feeling that it’s good to check out books, even if I don’t read them.) The Doomsday Book was weepy for me. You should try that if you haven’t yet. I’ve loved all three, but Doomsday Book is very different from the other two. This is much closer to TSNofD. It is a little repetitive in that the same jokes appear again and again, but with enough variations to stay fun. All Clear is the sequel the Blackout, and they both exist in the same world a To Say Nothing, with the time-traveling historians. From what I understand, the connections between the time-travel books are pretty loose. This sounds like fun! I’ve never read Willis, but I’ve had To Say Nothing of the Dog on my wishlist forever. Which one do you recommend reading first? I’d say either one. To Say Nothing is a little better, especially if you read Victorian literature, but either one will do to start with. Oh this sounds like good fun! Been awhile since I have read a Willis book. Will definitely try to get to this one soon! It’s so much fun. And I read it in less than a day–although being snowed in helped. An author I’ve never read, but heard many good things about, especially from one of our regular library patrons. She’s been trying to get me to read her for years! I’ll add this one to the TBR list! She’s definitely worth checking out. I’ve been impressed, too, at how different her books are from each other.